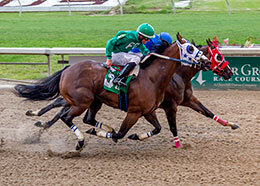 Barefoot Beach (#3) holds off Toastin With Corona in the French Quarter Stakes. NEW ORLEANS, LA�SEPTEMBER 3, 2016�Barefoot Beach popped from the gate under jockey Manuel Gutierrez then out-lasted Toastin With Coronas by a nose in the $40,000 French Quarter Stakes Saturday at the Fair Grounds. Miss Mallard Struts finished two lengths off the leaders in third. Barefoot Beach completed the 330-yard task in :16.679 seconds, to earn a 96-speed index. The $18,000 winners' purse brings his career mark to nearly $58,000. Yoani Abreu saddled the Texas-bred for owner Samuel Martinez. Bobby D. Cox bred the stakes winning son of IVORY JAMES from the Invisible Injun mare Babe On The Beach. Toastin With Coronas, a homebred racing for owner/breeder Gene Cox and trainer Trey Ellis, earned $8,000 for second. John Hamilton rode the filly. Adrian Huitron saddled Miss Mallard Struts for owner Jose Luis Perez Aguirre. Damian Martinez was aboard the filly. Bred by Gerald Patin, the sorrel filly earned $4,400. Jls Ms Politicaljess, Punctuality, Tac It Sassy, Fyre Fly and Cartels Fortune completed the field.